The passing of the winemaking torch at Mission Hill Family Estate has been exceptionally smooth. John Simes, the legendary New Zealand-born winemaker, who has been there since 1992, was succeeded after the 2014 vintage by Darryl Brooker, previously the winemaker at CedarCreek Estate Winery, which Mission Hill had acquired early in 2014. Darryl holds the title of vice-president as well as chief winemaker. Born in Canberra, Australia, in 1973, Darryl came to the Okanagan in 2010 after making wine in Australia, New Zealand and Ontario. John remains involved at Mission Hill, overseeing the vineyards, and Darryl still taps his expertise. The wines currently available reflect the seamless transition from one talented winemaker to another. Mission Hill has a large portfolio, divided into tiers. The entry-level tier is called Five Vineyards, reflecting the fact that Mission Hill operates at least five vineyards throughout the Okanagan. In ascending order, there is a reserve tier and a terroir tier. The Legacy Collection sits at the crown of the portfolio. The Terroir Collection wines, which were the last major initiative by John Simes, are available exclusively at the winery because production is limited. These wines are made with grapes that are among the top three percent of the fruit in Mission Hill’s vineyards. The Legacy wines includes a Chardonnay called Perpetua, a red Bordeaux blend called Compendium and another red blend called Quatrain, which includes Syrah in the blend. The flagship is Oculus, the Bordeaux blend that Mission Hill launched in 1997. It is now one of the Okanagan’s outstanding Icon wines. Mission Hill Five Vineyards Pinot Grigio 2015 ($12.99). This wine is screaming good value. It is juicy with aromas and flavours of peach and lychee. Absolutely delicious. 90. Mission Hill Five Vineyards Rosé 2015 ($12.99). This may be sold out but it is another delicious wine for the price. It has aromas and flavours of cherry, strawberry and watermelon, with a lingering fruit sweetness on the finish. 89. Vineyards Pinot Noir 2014 ($15.99). This is a silky, medium-bodied Pinot Noir long on quaffability, with aromas and flavours of cherry and with a spicy finish. 88. Mission Hill Reserve Sauvignon Blanc 2015 ($20.49). This refreshing and vibrant wine delivers lush aromas and flavours of tropical fruits, including lime and grapefruit. The wine is beautifully balanced with a creamy texture. Twenty-one percent was fermented and aged six months in French oak. 91. Mission Hill Reserve Pinot Gris 2015 ($20.49). Twenty percent of this wine was fermented in barrel, adding depth and complexity to the final blend. It has aromas of spice and citrus, with flavours of peach and citrus. 91. Mission Hill Reserve Chardonnay 2014 ($N/A). This wine, with buttery and toasty notes on the nose, is a reminder that one can always count on Mission Hill Chardonnays to deliver. The wine is rich and buttery on the palate, with flavours of marmalade and orange zest and with a lingering finish. 91. Mission Hill Reserve Merlot 2014 ($24.99). This is 87% Merlot, 8% Cabernet Franc, 3% Cabernet Sauvignon and 2% Petit Verdot. The wine was aged 13 months in French and American oak. The firm, age-worthy texture is typical of Okanagan Merlot. The wine begins with aromas of vanilla, cedar, black cherry and black currant. The dark red fruit flavours, reminiscent of Black Forest cake, develop as the wine breathes. This delicious wine came into its own after being open overnight. 91. Mission Hill Reserve Cabernet Sauvignon 2014 ($25.99). The wine, which was aged 13 months in French and American oak, begins with aromas mint, cassis and vanilla. On the palate, the texture is concentrated, with flavours of black currant and plum. 92. Limited Edition Viognier 2015 ($N/A). Here is another wine not on the winery’s website, meaning it is available just at the winery. The wine begins with appealing floral aromas with notes of apricot, peach and honeysuckle. The palate is rich with flavours of stone fruit and ripe apple. 91. Mission Hill Terroir Collection Bluebird Passage Viognier 2014 ($30 for 423 cases). These two Viogniers are something of a benchmark for Okanagan Viognier. This wine begins with appealing aromatic notes of stone fruit. On the palate, there are rich and luscious flavours of peach, apricot and mango. The finish is long and lingering. 93. Mission Hill Terroir Collection Bluebird Passage Viognier 2015 ($30 for 398 cases). This is a single vineyard wine. One third was fermented in a concrete egg, one third in older oak barrels and one third in stainless steel. Darryl’s objective: “A big, unctuous Viognier but with nice aromatics and brightness to it.” A terrific wine, it begins with aromas with floral and ripe apricot notes. The palate is luscious, with flavours of apricot, peach and mango. The finish lingers. 92. Mission Hill Terroir Collection Whispering Hill Organic Merlot 2013 ($N/A). This wine is made with grapes from a 14-acre vineyard near Oliver that has been managed organically since it was planted in 2006. In 2013, Mission Hill began the process of getting organic certification. The wine begins with intense aromas of plum, blackberry and blueberry, which lead to flavours of black currant, black cherry and blueberry jam. There is a touch of chocolate on the finish. 92. Mission Hill Terroir Collection Whispering Hill Organic Merlot 2014 ($N/A). Like the previous vintage, this wine is remarkable for its concentration. It begins with aromas of spicy cassis, leading to flavours plum, blueberry, chocolate and licorice. 93. Mission Hill Terroir Collection Crosswinds Syrah 2012 ($65 for 950 cases). This wine as aged 13 months in French oak. Even after several years in bottle, the wine still has grippy tannins and notes of oak and vanilla. However, once decanted, it shows aromas of spice, cedar and white pepper, leading for flavours of black cherry and chocolate. The wine has intense concentration. 91. Mission Hill Perpetua 2013 ($50). This is an elegant Chardonnay with aromas of citrus, butter and toast. On the palate, the citrus and apple notes are supported by a mineral backbone and by bright acidity. 91. Mission Hill Compendium 2012 ($75 for 2,500 cases). This is 42% Cabernet Sauvignon, 41% Merlot and 17% Cabernet Franc. The volume of this wine speaks to the quality of the fruit Mission Hill is getting from its Osoyoos vineyards. The wine was fermented in small French oak fermenters and aged 14 months in French oak. The wine has aromas of oak and cassis leading to flavours of plum and black currant, with a hint of dark chocolate on the finish. 93. Oculus 2013 ($125 for 1,975 cases). This wine, not yet fully released, is 51% Merlot, 23% Cabernet Sauvignon, 22 Cabernet Franc and 4% Petit Verdot, all from Osoyoos vineyards. It was fermented in small French oak fermenters and aged 14 months in French oak. It begins with appealing aromas of black cherry, blueberry, vanilla and a suggestion of oak. On the palate, there are flavours of black currant, black cherry, black coffee and dark chocolate. The long, ripe tannins give this elegant wine a svelte and polished texture. Because of its youth, I doubled decanted the wine. But for the need to reviewing it, I would have cellared it for seven to 10 years, allowing it to blossom naturally. 94-95. For at least 60 British Columbia wineries, their presence at the Vancouver International Wine Festival in February takes on added importance in light of the new U.S. administration’s protectionist attitudes. Having a high profile at one of North America’s best wine festivals gives the wineries a further chance to connect with consumers. British Columbia wineries already enjoy considerable consumer loyalty. They have a 17% market share, according to the B.C. Wine Institute. I am actually surprised it is not higher. The Festival recently hosted a tasting for wine trade and media and poured a representative selection from the 1,700 wines that will be poured during the week-long event. Festival staff may well have cherry-picked 29 wines to ensure that the BC wines stood out. Nevertheless, I thought that the best wine in the room at this mini-tasting was Mission Hill Oculus 2012. Overall, the BC wines stood up very well against the American and other international wines. And one of the most mediocre wines in the room was a Sauvignon Blanc from California. The BC wineries at the Festival need to hope that consumers at the event continued to be impressed with BC wines. Even before Donald Trump had his tiny hands on the nuclear codes, the United States had launched a trade action against the BC wine industry. The Americans argue that allowing exclusive grocery store access for BC wine is an unfair trade practice. Canada has been the single largest export market for American wines, predominantly California wines, since 2008. California wine sales to Canada in 2015 totalled $461 million. While BC has been a good market for California wines, their market share here is about a third of the market share of BC wines. Hence, the argument that setting up an exclusive sales channel for VQA wines is discriminatory. The Overwaitea Food Group began selling VQA wines in selected grocery stores in April 2015. Seven Overwaitea/Save-on-Food stores now have wine sections. The company controls other VQA licenses not yet activated. As well, Loblaw’s and other grocery chains have, or are acquiring, grandfathered wine store licenses for the sale of just BC wine. In theory, they could sell imported wine, but only in a separate section of the store. That would lack the appeal and the convenience of the VQA wine section. The trade action was finally launched just a few days before the Trump inauguration by Michael Froman, President Obama’s trade representative, and is being continued by Trump’s trade representative. Never mind that their preferred wines currently are BC wines, by a big margin. Never mind that imported wines are sold in 600 private stores and 200 BC liquor stores. I cannot admit to a great deal of sympathy for the American position, given the pride I take in the remarkable accomplishments of the BC wineries. If the US is adopting an American First policy, surely it is not discriminatory if we have a BC First policy regarding our wines! Sadly, while the trade action will take some years to resolve, at the end of the day the Americans are likely to prevail and grocery stores will be opened to all wines, not just VQA wines. It would deprive VQA wines of an important marketing advantage, but that will not be the end of the world. The quality of BC wines now easily matches the quality of imported wines and BC’s “sophisticated” consumers obviously know that. However, the BC wine industry needs to keep up its efforts to convince consumers this is so. Taking part in the Vancouver International Wine Festival is an important promotional effort. Here are some of the stellar BC wines you will find at the Festival, both at tasting events and in the on-site liquor store, based on wines the Festival has previewed. Black Hills Nota Bene 2014 ($60). The wine has sage and herbal notes on the aroma and the finish. The fruit flavours include black cherry, plum, coffee and chocolate. The texture is rich and ripe, with long tannins. The winery says this was “more masculine” than previous vintages – even after dialling back the Cabernet Sauvignon, which speaks well of the quality of the Merlot. 92-94. Burrowing Owl Syrah 2014 ($40) The wine begins with aromas of ripe, dark fruit – plum and black cherry – with floral notes, perhaps reflecting the four percent co-fermented Viognier in the blend. It is rich and juicy on the palate, with a smoky hint on the finish. 92. Haywire Switchback Vineyard Pinot Gris 2015 ($25). Here is a Pinot Gris with good weight on the palate. It has aromas and flavours of pear, apple and citrus. 88. Jackson-Triggs Okanagan Estate SunRock Shiraz 2014 ($27). This full-bodied red begins with aromas of fig, plum and leather. The flavours are bold and intense: black cherry and fig with black cherry on the finish. 92. Mission Hill Oculus 2012 ($125). This wine is juicy in texture with aromas of cassis, black cherry and red liquorice, leading for flavours of red and black fruits. It has a svelte, polished finish with long ripe tannins that promise 10 to 15 years of improvement in the cellar. 94. Nk’Mip Cellars Qwam Qwmt Pinot Noir 2015 ($27). Here is a rich, bold Pinot Noir, dark in colour, beginning with aromas of spiced cherry. On the palate, there are luscious flavours of cherry and strawberry. The seductive texture is all velvet. 92. Sandhill Small Lots Viognier 2015 ($25). This wine has aromas and flavours of peach, apricot and apple, with a rich texture and with bright acidity to create a refreshing finish. 90. In 1993, when the founders of Tinhorn Creek Vineyards bought the Golden Mile vineyard for their winery site, one of the varieties planted there was Kerner. That block of Kerner was finally pulled out after the 2016 vintage. Roussanne will be planted instead, undoubtedly a better choice - but another nail in the Kerner coffin in the Okanagan. Perhaps a dozen wineries once made Kerner but the number of producers is declining. I profiled the variety and some of the producers in Chardonnay and Friends, a 1998 book now out of print. In memory of Tinhorn Creek’s Kerner, here are a few excerpts that provide background on the variety. It was planted in the Okanagan in the first place in the belief the valley was best suited for cool-climate German varieties. Kerner was a comparatively recent variety at the time. 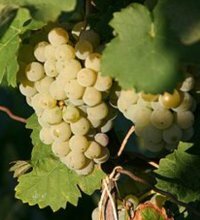 In 1969 Germany’s Weinsberg Institute in Württemberg classified a new white grape created in 1929 by crossing Trollinger, a red variety, with the great Riesling. Vine breeder August Herold called the variety Kerner -- for nineteenth century German poet Justinus Kerner who had been one of Weinsberg’s leading citizens. It is one of the most successful new varieties to emerge from German plant breeding. The vine is vigorous, ripening reliably while maintaining the essential acidity in the grapes. The variety now has a toehold in vineyards beyond Germany, including both the Okanagan and Vancouver Island. Exceptionally versatile, Kerner’s wines cover the field from dry table wines to icewines. The wines are comparable to Riesling while perhaps slightly fleshier on the palate. The wines are attractive when fresh and young but also age well. In her otherwise excellent 1986 book Vines, Grapes and Wines, Jancis Robinson dismisses Justinus Kerner (1786-1862) as a mere librettist of drinking songs. In fact, he was one of the most distinguished citizens of Weinsberg where he lived most of his adult life and where he is buried beside his wife, a clairvoyant about whom Kerner once wrote a book. He had a medical degree from the University of Tübingen and ultimately settled his practice in Weinsberg, becoming district health officer. He also was an accomplished writer of both popular medical books and of poetry which blended romance, melancholy and the supernatural. In 1840 composer Robert Schumann set fifteen of Kerner’s poems to music, including Wanderlied (Travel-song), which opens with the line “Wohlauf, noch getrunken den funkelnden Wein (Come, one more glass of shimmering wine). The poem, however, is not a drinking song but a nostalgic memorial to a friend with whom he had shared wine. Weinsberg was so proud of its literary doctor that the city gave him a house (now a museum) just outside a historic medieval castle. Public buildings and city squares have been named for him; in 1895 a monument to Kerner was erected in Stuttgart, the state capital of Württemberg. The vintners who work with the Kerner, Weinsberg’s most successful wine grape, have quite some reputation to live up to. Sandra Oldfield at Tinhorn Creek only makes icewine from the Kerner grown in the winery’s Fischer vineyard (named for vineyard manager Hans Fischer who owned the property before selling it to Tinhorn Creek). 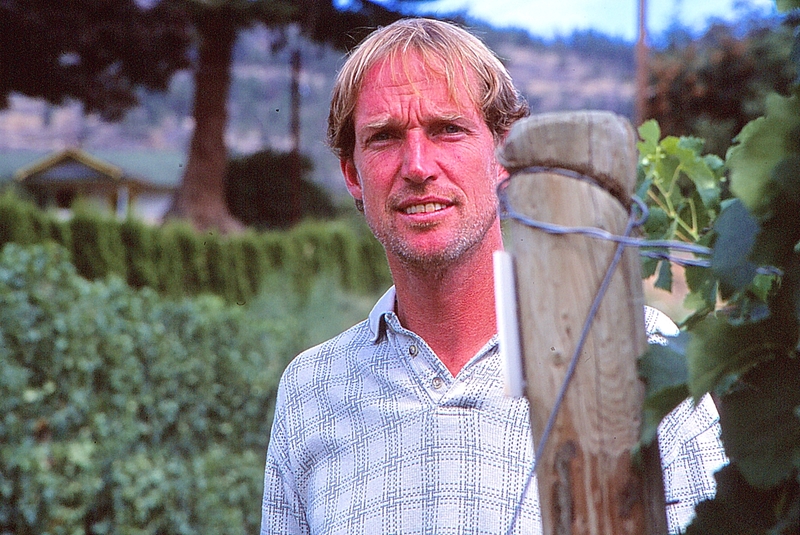 The California-born Oldfield, who had never encountered the variety before coming to the Okanagan, enjoys the flavours of dry Kerner table wine but dedicates Fischer vineyard grapes to icewine because this gives Tinhorn Creek a product of appealing uniqueness amid a sea of Riesling icewines. Thick-skinned Kerner is well suited for icewine. “It likes to cling to the vines and does a good job of hanging on the vines when the weather gets quite cold,” Oldfield discovered. “It holds its acid really well and the fruit remains healthy.” There are only two acres of Kerner in the vineyard, arranged in twenty-four rows, only eight of which are reserved for icewine in any year (the remaining grapes are sold to other wineries for table wine). The stress of retaining icewine grapes is rotated each year to a different eight rows. “There is a theory that you will kill them if you use the same vines for icewine year after year after year,” Oldfield says. Tinhorn Creek limits its production to a maximum of 2,500 half-bottles of Kerner icewine each year, all of it sold from Tinhorn Creek’s wine shop, where Oldfield cheerily takes her turn explaining the variety to visitors. The final vintage of Kerner Icewine made by Sandra was 2013. In 2014 she moved up to the presidency of Tinhorn Creek, handing over winemaking to Andrew Windsor. Born in Ontario and trained in Australia, Andrew had made Icewine in Ontario. But when he was confronted with Tinhorn Creek’s Kerner in 2014, he made an orange wine instead, fermenting the Kerner on its skins. “We did it in the cellar for interest’s sake,” Andrew told me last fall as we tasted the wine, which has not yet been released. The winery made just 75 cases of 500 ml bottles. The wine, which has a lovely orange hue, ended up as an interesting aperitif wine. “It is not oxidative but, for me, it has that dry, briny flavour profile that makes you want to eat some olives and hard cheeses,” Andrew said. Andrew also let me tastes three table wines that are favourites of the winemaking team. All will be released this spring. Tinhorn Creek Pinot Noir 2014 is a favourite of Korol Kuklo (left), the assistant winemaker at Tinhorn Creek (where she has worked since 1998). “We are certainly not known for Pinot Noir,” Andrew conceded. However, the winemaking here has been tweaked. About 10% of the grapes going into the fermenter as whole clusters. Half the ferment was with native yeast. A modest quantity of new oak – 10% new, 5% second fill – ae used for maturing the wine which, traditionally was aged just in neutral barrels. The result is a rich and juicy style, with spice and cherries in the aroma and on the palate. I scored it 91 points. Tinhorn Creek Oldfield Reserve Chardonnay 2015, with a production volume of 450 cases, was fermented in new French oak and has aged in French oak. The wine has an appealing toasty note on the nose and in the finish, sandwiching a rich core of marmalade fruit flavours. I scored the barrel sample 93 points. It is expected to be priced $35. The third sneak preview was Tinhorn Creek Oldfield Reserve Syrah 2014. Andrew had plenty of experience with the variety, both in Ontario and in Australia, where he worked for Mollydooker Wines in McLaren Vale but he never had a chance until Tinhorn Creek to co-ferment Syrah and Viognier. In that and in subsequent vintages, the winery pressed its Viognier and put the juice into a white blend. The skins, however, were put in the fermented with the crushed Syrah, adding complexity to the wine. The wine began with the perfumed aromas hinting of stone fruit and black cherry, with a whiff of white pepper. Densely textured, the wine has flavours of plum and fig, with black coffee and dark cherry on the finish. I scored it 92 points. Previous vintages were labelled Oldfield Series. That label is being changed to Oldfield Reserve “just so that we don’t have to explain to people the wines are reserves,” Andrew said. Major changes at Road 13 Vineyards in 2016 foreshadow exciting wines from this Golden Mile winery, adding to the stunning wines already being produced. First, the winery has made a significant shift in grape sources, selling its Black Sage Road vineyard while acquiring a 50% interest in the Blind Creek Vineyard in the Similkameen Valley. The swing to Similkameen fruit began several vintages ago. J-M Bouchard (right), the Road 13 winemaker until mid-2016, had become a passionate advocate of the wines he was making from Blind Creek grapes. Blind Creek, about 100 acres in size, by developed by two Penticton businessmen, Larry Lund and Ron Bell. Planting began there about 2005. There briefly were plans for a winery there. When that was shelved, the grapes were sold to a number of wineries. The resulting wines have helped establish the vineyard’s reputation. Road 13 also changed winemakers in 2016. When J-M left to consult, Road 13 recruited Jeff Del Nin from Church & State Wines, where he developed a reputation for making award-winning premium wines. Born in Thunder Bay in 1971, Jeff (left) got a master’s in chemistry and started his career in plastics and polymer research. He went to Australia on vacation and ended up working for a company developing synthetic closures for wine. His exposure to Australian wines led him to him to the University of Adelaide and a degree in winemaking. He returned to Canada in 2006, where he did three vintages at Burrowing Owl Winery before joining Church & State. At Church & State, he overlapped with Bill Dyer, the legendary Napa consultant who had launched Burrowing Owl wines and then helped Church & State find its feet when the winery moved from Victoria to the south Okanagan. Jeff’s ambitions line up with Road 13’s increasing commitment to wines made with Rhône varietals. For example, in its home vineyard on the Golden Mile, the winery has replaced Pinot Noir with Roussanne vines. In 2016 Road 13 also increased its volume of concrete eggs for fermenting and finishing wine, something that had been started under J-M. with the purchase of five 700-litre eggs from France. Last fall, Road 13 added a dozen 1,750-litre eggs from an Italian supplier. “When you see the dramatic difference in quality for the Rhône varieties coming from the eggs, it is just a no-brainer,” Joe says. Road 13 now produces about 40,000 cases a year and has found particular success in several sales channels, including grocery stores and its wine club. Last year, the winery augmented its original wine club (where members enjoyed discounts without committing to regular purchases) with a second club (where members commit to purchasing regularly and get more perks). “We launched that in June and as of last week, we have almost 500 members,” Joe told me in mid-October. When the membership reaches 2,000, he is considering launching a third ultra-exclusive club. J-M had begun making the super-premium wines (usually with Blind Creek grapes) that would appeal to an exclusive set of buyers. Examples are three Road 13 wines I tasted during a winery visit in October. Road 13 Jackpot Petit Verdot 2013 ($75). This wine, typical of the variety, is very dark in colour and densely textured, with flavours of black fruit, black olives and espresso. The wine has a firm backbone of ripe tannins and minerals. 93. Road 13 Jackpot Cabernet Sauvignon 2014 ($N/A). This wine, which has not yet been released, is made from Blind Creek fruit. The wine begins with aromas of mint and cassis, leading to flavours of cassis, black cherry dark chocolate and coffee. Sweet fruit flavours develop as the wine breathes in the glass. This wine sets a benchmark for Okanagan Cabernet Sauvignon. 95. Road 13 Fifth Element 2012 ($49). The wine, which seems to be sold out at the winery, is a blend of 47% Merlot, 19% Syrah, 16% Cabernet Sauvignon, 9% Cabernet Franc, 5% Malbec and 4% Petit Verdot. This is Road 13’s flagship red blend, and one that Joe would like to age an extra year in bottle. This vintage was still firm. It begins with aromas of black currant and cherry. Those are echoed on the palate, along with flavours of black coffee and dark chocolate. 93. Any winemaker’s greatest challenge is to find names for his or her wines that are not already protected by someone else’s trademark. A winemaker in Washington State once told me that “the car companies have the best names.” Perhaps that explains by Van Westen Vineyards – where all wines begin with a V – has not called any of its wines Viper. Fiat Chrysler, as the company is now called, has had a Dodge Viper in its line since 1992. As it happens, the company is ending production of the Viper this year. Perhaps that opens an opportunity for Van Westen, although Rob Van Westen does not appear to be running out of ideas. When he released his first Malbec, he called it Violeta, presumably because the beguiling aroma of this variety suggests violets to some. Every wine that Robert Van Westen releases has a name that begins with V – sometimes with a hilarious result. The winery’s first Cabernet Franc was released in 2010 as Vrankenstein because the variety is usually harvested on Halloween. The Icewine was called Vicicle. But even if the wine labels are light-hearted, the wines are serious. Rob, along with his father and brother (both named Jake), are some of the best farmers on the Naramata Bench. The family, now with 21 hectares (52 acres) of cherries, apples and grapes, has farmed on the Naramata Bench ever since Jake Van Westen Sr. emigrated from Holland in 1951 after graduating from agriculture school. Rob, tall enough to tower over his vines, was born in 1966. He left school after the 10th grade and worked at construction in Vancouver until 1999, when he returned to help with the family’s newly planted vineyard. He embraced viticulture with a passion, studying at Okanagan University College and, when he began making wine, spending nearly four months at wineries in Australia and New Zealand. CedarCreek Estate Winery began buying Van Westen grapes. Impressed with the quality of the fruit, CedarCreek’s winemaker at the time, Tom DiBello, encouraged Rob to make wine. Rob launched the winery in 2005. Since then, he has moved winemaking into a hulking apple packing plant on one of the family’s properties. In 2009 he installed an informal tasting room here as well. When it is open, Rob presides over lively informal tastings. The spirit of the wine shop is mirrored aptly by the name that Rob has assigned to new Merlot: Vivre la Vie. The Van Westens have five hectares (12 acres) of vineyards, with another hectare or two slated for planting. They grow Merlot, Cabernet Franc, Pinot Gris and Pinot Blanc and plan to add Pinot Noir and Cabernet Sauvignon -- but no Chardonnay. “I’ve never been a Chardonnay drinker,” Rob admits. Conveniently, considering the winery’s “V” theme, he does grow Viognier. Good fun aside, the wines are excellent. Here are notes on recent releases. Van Westen Viognier 2015 ($25 for 164 cases). This wine, which was fermented in neutral French oak, begins with aromas of apricot and pineapple. On the palate, which is rich, there are flavours of peach, apricot and melon. The backbone of minerals and tannin contribute to a crisp, dry finish. 90. Van Westen Vivacious 2015 ($20). This is Pinot Blanc with a splash of Pinot Gris. Slightly gold in hue, the wine is rich on the palate. It begins with aromas of apples, leading to flavours of ripe apples, cantaloupe and marmalade. 91. Van Westen Vino Grigio 2015 ($20). This is a refreshing Pinot Gris with aromas of citrus and apple. This leads to flavours apple, pear and citrus. 91. Van Westen Vixen 2015 ($20 for 82 cases). This late harvest wine is 52% Pinot Blanc, 48% Pinot Gris. The hue is light gold. The wine, with a hint of botrytis, has honeyed aromas and flavours of ripe apples and apricots, hints of poached pears and caramel. The wine is well-balanced, rich in texture and with a lingering honeyed finish. Not overly sweet, it is a wine for cheese. 91. Van Westen Violeta 2013 ($35 for 112 cases). This is the winery’s second vintage of Malbec. The wine had a peppery aroma mingled with red berry notes. On the palate, there are flavours of red and black currant punctuated with a note of pepper on the finish. 91. Van Westen Vulture 2013 ($40 for 145 cases). This Cabernet Franc was aged 20 months in French oak. The wine begins with aromas of black currant, cherry and vanilla, leading to flavours of cherry, red currant and huckleberry, framed subtly by oak. The long ripe tannins give the wine a rich texture. 92. Van Westen Vivre La Vie 2013 ($30 for 208 cases). This is 100% Merlot. The grippy tannins when the wine was newly opened were transformed, with decanting, to chewy ripe tannins. The wine begins with aromas of black currant, blueberry and vanilla, all of which are echoed in the flavours. 90. Foxtrot Vineyards, the Naramata-based Pinot Noir specialist, made its first vintage in 2004. But it took the winery another decade to produce its first brochure. There is a story here. Proprietor Torsten Allander has spent the last two years hand-selling the winery’s Pinot Noirs to premium restaurants and wine merchants in southern California. He was asked for a winery brochure so frequently that Foxtrot has had to print one. The winery is well-known in British Columbia; indeed, it is renowned. In California, however, it usually is a surprise for the residents to learn that wine is even made in Canada, let alone wines of world-class quality. The winery is owned by an elegantly-mannered retired pulp and paper engineer, Torsten Allander. In 2002, he and his wife Elisabeth (the family calls her Kicki) retired to a 1.4-hectare (3.5-acre) on Naramata Road planted entirely with Pinot Noir. After selling the grapes to another winery for a few years, Torsten enlisted Lake Breeze Vineyards in 2004 on a three-year winemaking trial with his grapes. “I wanted to convince myself before I invested a lot of money in a winery that we can produce a top wine that can compete on a world level,” Torsten recalled. The acclaim which the initial vintages received left no doubt about the quality of the Foxtrot Pinot Noirs. In 2008, Torsten and his winemaker son, Gustav, built a winery and cellar with the barrel capacity for 2,000 cases of wine. They will need to consider expansion in a few years because, in 2012, Torsten bought an adjoining two hectares (five acres) of orchard. The fruit trees are being replaced with Pinot Noir vines propagated from cuttings of Foxtrot’s clone 115 Pinot Noir. “It is such an uphill battle,” Torsten said recently, recounting his successful effort to get Foxtrot Pinot Noir into California. But he now has an agent in San Diego and has the wine in a number of top restaurants. He is setting his sight on Palm Springs and Palm Desert. Those markets should be a little easier because the many Canadians with property there likely will know good wines are made in British Columbia. British Columbia wineries need to pick their spots carefully when offering product in California, he believes. There is not much point selling Canadian Chardonnay there, since California is awash with good Chardonnay (and Foxtrot also makes a good Chardonnay). Nor did Torsten get much of a take on the Viognier and the rosé from Foxtrot. However, Pinot Noir has a special cachet in many markets. Californian consumers are used to premium-priced Pinot Noirs from Oregon. It is probable these helped blaze the trail for British Columbia. Foxtrot is about to release three Pinot Noirs from the superb 2014 vintage. The winery is also participating in the Vancouver International Wine Festival in early February. Several of these wines, including the Chardonnay, will be poured at the Foxtrot table. A reminder to those who might want to buy the wines: the BC Liquor Distribution Branch always has a liquor store at the festival, stocking wines that producers have on the tasting room floor. Keep in mind that the liquor store stock is limited. You need to shop early before the stock runs out. Foxtrot Foxtrot Vineyards Pinot Noir 2014 ($57.90). Here is a wine appealing to all the senses, beginning with a shimmering ruby hue in the glass. The perfume of spicy cherries is the wine’s seductive invitation. On the palate, the flavours of cherry and strawberry are framed delicately with lightly toasted oak. The texture is elegant and silken. The wine has a lingering red berry finish. 93. Foxtrot The Waltz Pinot Noir 2014 ($50). The grapes for this wine are young fruit from the Foxtrot Estate and fruit from other Naramata vineyards the winery has under contract. However, the wine has the same elegant, silky style of the estate Pinot Noir. The wine begins with aromas of cherry and raspberry. On the palate, flavours of spice and lightly toasted oak mingle with cherry and raspberry. 90. Foxtrot Reimer Vineyard Pinot Noir 2014 ($57.90). The grapes for this wine are from a vineyard in East Kelowna. The differing soils and terroir show through in a wine’s distinctive aromas and flavours of cherry and plum, as well as in the minerality on the backbone. This wine benefits from decanting, to bring out its silky and full-bodied texture. 92. Readers will recognize that this blog has appeared previously. It appears again with some minor details corrected. The tasting notes are unchanged. 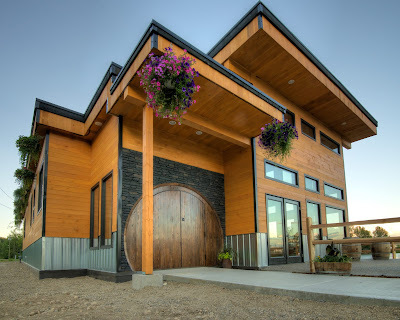 Northern Lights Estate Winery, which opened in 2015, is the northernmost winery in Canada. At 53.5 degrees north, it is a full three degrees of latitude closer to the North Pole than Celista Estate Winery above Shuswap Lake and four degrees higher than Auk Island Winery at Twillingate, Newfoundland. But these wineries all belong to a growing group of producers pushing the envelop in northern climes. There are wineries above 60 N. throughout Scandinavia and there are at least five wineries in Alaska. Solitude Springs Farm & Vineyard at Fairbanks is at 65 N.
Why are wineries galloping ahead of global warming? Partly it is that people in the wine industry are uncommonly passionate about what they do. And partly, it is because there often is an enthusiastic local market for the wines. That about sums up the Bell family, the owners of Northern Light; and it sums up the market. This fruit winery’s sales are running about three years ahead of the business plan. The winery is managed by Doug Bell, his father, Pat, and his mother Brenda. The winery idea was sparked when Pat Bell was British Columbia’s minister of agriculture from 2005 to 2008, with responsibility for wineries in his portfolio. The Bells have an established track record in the Prince George business community. Pat Bell, Sr., the Bell patriarch, helped the Wendy’s restaurant chain establish franchises across western Canada. In 1988, he left the corporate world to open his own Wendy’s in Prince George. The Bells now operate two restaurants there. Pat Bell went into politics in 2001 and retired from the legislature in 2013. “I grew up in the family business, doing many different things,” says Doug says, who has a commerce degree from the University of Northern British Columbia. About the time Pat went into politics, Doug joined a group developing oil change franchises and then worked in human resources. In 2007, a love of retailing brought him back to the family businesses which at various times also included car rental agencies, logging companies and farm operations. Just as the Bells were putting together their wineries plans, the owners of Bonaparte Bend Winery, a fruit winery at Cache Creek, decided to retire, closing a winery that had opened in 1999. Northern Lights bought the winery’s equipment and some of Bonaparte Bend’s remaining wines. To make Northern Lights wine, the Bells retained Christine Leroux, a consulting winemaker and educator based in Penticton. Her previous clients have included Elephant Island Orchard Wines, one of the most acclaimed of the Okanagan’s fruit wineries. The handsomely designed winery and tasting room are the work architect Everest Lapp, who owns Elevation Design Studio on Pender Island. Conveniently, she also is an aunt to the Bell brothers. The design will accommodate a future restaurant. “We are looking at constructing a facility similar to the Hester Creek demonstration kitchen to start with,” Doug says. “It is about bringing the food and the wine together, in a way that people can interact with; whether it is the chefs doing cooking classes; whether it is an intimate dinner with set menus; or during the day, a café/bistro style. The winery buys fruit from sources in addition to its own orchard. Northern Lights has been the first fruit winery in B.C. to release a product made from the haskap berry. Grown by Heritage Farms at Quesnel, haskap is a Japanese name for the edible blue honeysuckle. Since 2006, several varieties have been developed by the University of Saskatchewan. “It is going to be a very premium wine,” Doug predicts. “The berry has a deep rich red colour. And it ages very nicely.” The winery’s first releases, now sold out, is a blend of haskap and blueberry and was aged in Hungarian oak. Northern Lights already considers this its flagship wine. Here are notes on three Northern Lights wines that I have been able to taste. Northern Lights Seduction NV ($17). This aromatic wine, now sold out, is a blend of strawberry and rhubarb. It has a pale blush hue and has an appealing strawberry aroma. Well balanced, it has subtle flavours of strawberry. The role of the rhubarb is to add the refreshing, tangy acidity that gives the wine a reasonably dry finish that lingers. This is a bottle I would take on a picnic or have with salad in summer. 90. Northern Lights Bumbleberry NV ($18). This wine is a blend of raspberry, saskatoon and blueberry. The ruby colour is appealing in the glass. The aromas and flavours of raspberry explode from the glass and coat the palate. This is fruit wine’s answer to Beaujolais. It is a lively and refreshing wine that I might want to a pair with spicy food. 89. Northern Lights Cassis Noir NV ($19). This is a black currant wine, striking for its fruity aromas and flavours. The usual bracing acidity of black currant is balanced here with some residual sugar. The texture, however, is silky. 87.